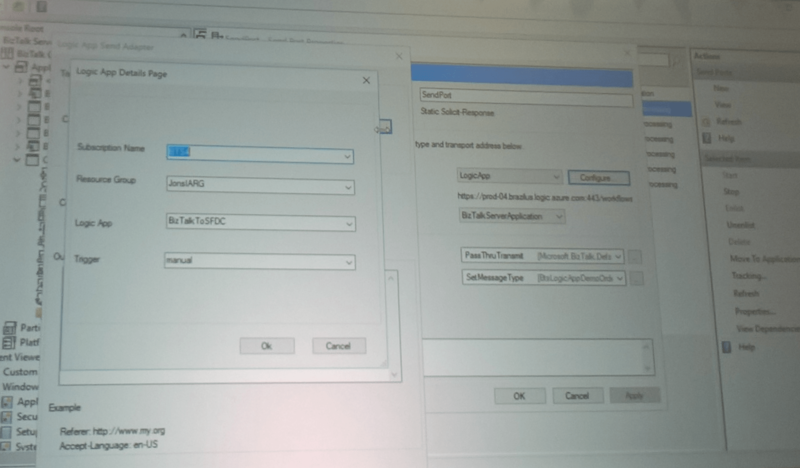 This means BizTalk will be getting adapters which will allow it to be easily integrated with the cloud, like Service Bus (which we already have) and Logic Apps, allowing it to consume Logic Apps and the cloud connectors. 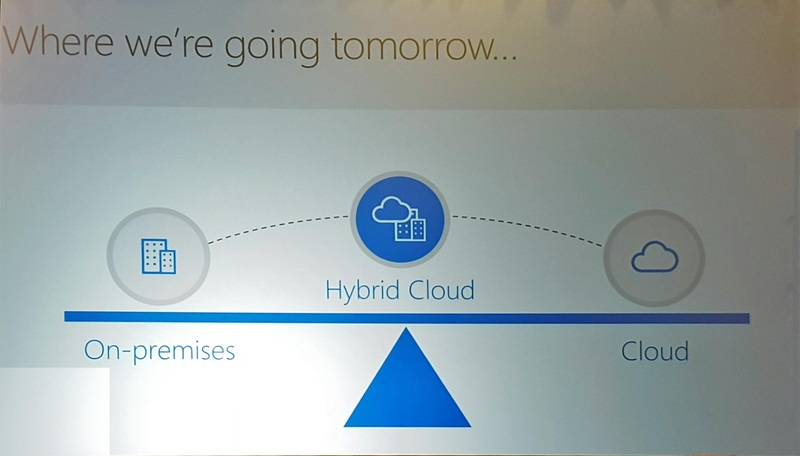 Also we will be getting connectors in Azure which will allow us to easily connect from Logic Apps to BizTalk, giving us a true solid hybrid experience. 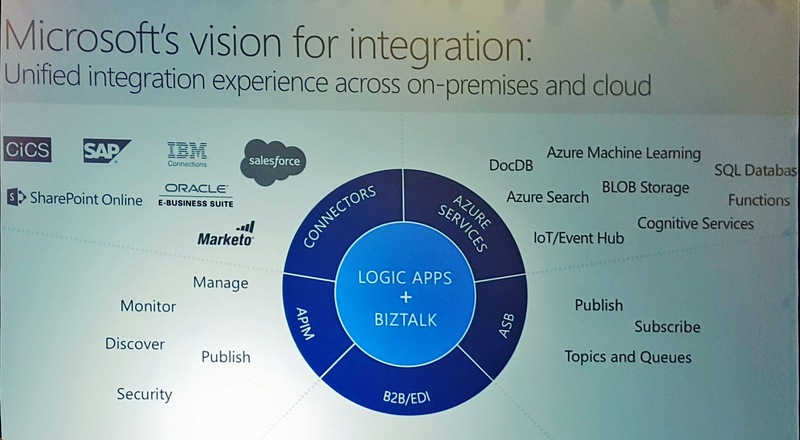 Microsoft has a very wide offering with Azure, and now with BizTalk and Logic Apps in the center of their integration offering, things are really starting to get together. We can use BizTalk for our on-premise applications and Logic Apps for our cloud applications, but there is much more. For example, we can use Azure Functions to create small re-usable pieces, which we can use stand-alone, or from Logic Apps. 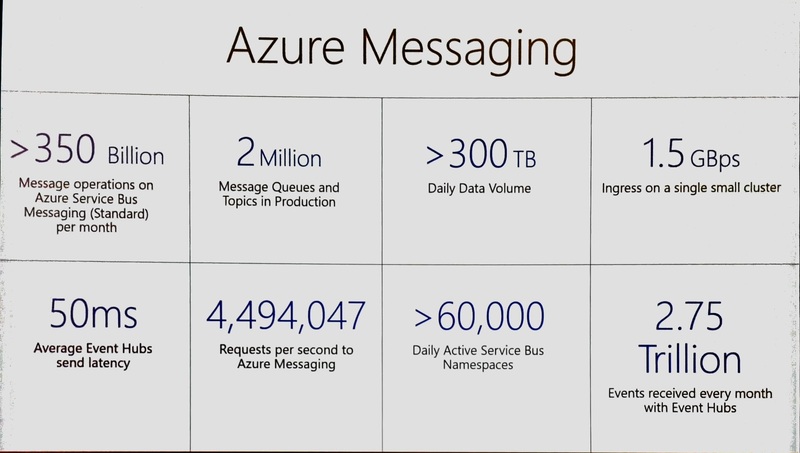 The Service Bus stack can be used for our messaging needs or IoT scenarios. For exposing and managing our API’s, including those provided by Azure Functions and Logic Apps, we have API Management to our disposal. And there’s many more services we can use to build and complement on our scenarios. As for our B2B and EAI, Microsoft will introduce a premium pack on Logic Apps called Enterprise Integration Pack, which will be able to handle your EDI requirements, including TPM etc. As you can tell from my blog posts, I am a big IoT fan, and I really think this will be one of the major growth enablers for us integrators. It was good to see that a lot of sessions at Integrate 2016 were on this subject as well, including announcements from the Service Bus team. For example the Premium tier has been announced for Service Bus, which will allow larger messages, isolation and dedicated resources. Also we heard that both Service Bus and Event Hubs will be coming to on-premise with the Azure Stack. Looking at the numbers for the Service Bus stack just keeps amazing me. Integrate 2016 was once again an amazing event for me, I had a lot of fun catching up with old friends, making new friends, hearing all this great new news, and seeing love Microsoft is once again showing for us integrators. For anyone working in the Microsoft integration space, I can only recommend attending these events as well. For those who want to read some more recaps, here are some of my favorites. This entry was posted in Azure, Azure Functions, BizTalk, Event Hubs, IoT, Logic Apps, Service Bus by Eldert Grootenboer. Bookmark the permalink.